Not ready to play paintball? Want to get the rush of close quarters combat but worried paintball hurts too bad? It’s okay – we thought so too! BUT now theres low-impact paintball which is perfect for ages 8 and up! 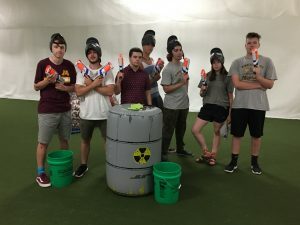 Don’t have Nerf Parties when you could host an indoor low-impact paintball party instead! 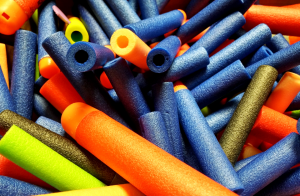 Nerf Parties used to be fun and paintball used to be scary but not now. 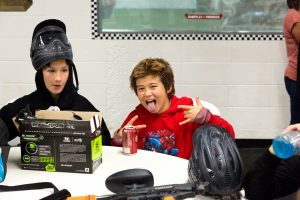 With less pain, less mess and less expensive – Paintball and not Nerf parties are perfect option for birthdays, youth groups and family gatherings! Get the rush of close quarters combat but without the sting! Try Low-Impact paintball and forget the bruises and sting of traditional paintballs! With low-impact paintball delivering a fraction of the sting and bruises we are able to run groups as low as 8 years old! * We no longer offer Nerf Parties as most of our groups ended up playing indoor paintball instead. * Have questions? Please feel free to give us a call at 651-222-0300.